Every now and then an album comes along that is deceptively simple. The production isn't overworked, the lyrics aren't meant to talk down to you and the songs aren't there to open a gigantic philosophical discussion that will lead you through the rest of your life. It's albums like this that you can just throw on and let them take you where you need to go. 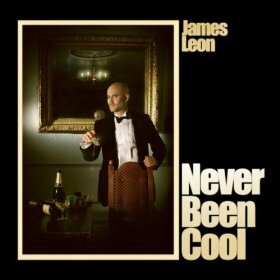 If that is a place of carefree frivolity where cotton candy and bubble gum fluff are the main dietary necessities or somewhere hopeful and romantic; James Leon's new album, Never Been Cool is the road map you need. I'm not going to say this album is overly ambitious because it's not. Everything it sets out to do, it does. It makes you feel good and gives you something to think about with some of the tracks but more than anything, it's a solid first release from a burgeoning pop icon. I think this album has an overall feeling of camp to it and with that being said, I would more than happily stand this album up beside anything Andy & Vince or Neil & Chris or even Marc Almond and call it a welcome addition to that club. It has solid sensibilities in 2011 and pays homage to those great artists from the past. It's not a dance record, is a pop album and it is good. A good friend of mine once told me that if you can listen to an album 10 times in a row and not be sick of it, then it's a good album. This is one of those. There is something that is a bit wonky on the album and that increases it's level of hipness and it intensifies the overall feeling of actually being cool. The songs are poppy and sick with you for days after listening to them. This is definitely an album that is going to be there when I need a pick me up. I mentioned to James that I loved the cover art and noticed how his bow tie is a bit of kilter to which he replied, "Kind of like me" There is a bit of gold on his cheek and that to me is a tribute to David Bowie on some level and it is also a small bit of glamour. Purple Heart has always been my favorite track ever since he first sent it to me. I love the emotion behind the track and it reminds me of myself in a lot of ways. With it's driving beat and orchestral movements, The One Before Me has enough scorn and righteous fervor to say, "What are you doing! We have a good thing and you are going to lose it if you don't stop what you're doing". I want to get lost in the crowd at the Club with No Name. Just to be in there spinning around and around with the beautiful people. I bet Keith Harring, Leigh Bowery, Grace Jones and Toyah would all be there. I look forward to hearing more and more from James. I think he has a brilliant career in front of him and I am glad to be a fan. I did read that this album was self financed so don't be a dickhead and steal it. It's £6.99 or $8.98 USD on Amazon either in the UK or the States. And if this album represents what it means to Never be Cool...then I don't want to be cool either. This is Ryan Lill. He shared with me on Google + and I've been listening to him this morning. I am a HUGE fan of guitar/vocal type music. Jay Brannan is one of my all time favorite artists and Ryan reminds me of him a bit. This is Ryan's cover if "Hometown Glory" by Adele and while his arrangement doesn't stray too much from the original, his voice brings subtle nuances to the song that make it his own. Hometown Glory was the first song by Adele that I ever heard and it's probably my most favorite of all of her songs. With a voice like his and the passion he puts in his music, I want to see him go far. I am going to continue to follow him and support him because I feel he is well worth my time. Give him a listen and see how you feel about his music. p.s. here is his cover of Landslide....another one of my all time favorite songs. So here's the deal. Elephant isn't going to hold your hand and tell you everything is going to be ok. They are going to say things that won't necessarily sit will with everyone but they are things that need to be said because the gay community is made up of so many different people and those people think and feel differently from everyone else. I've been spending some time with their music and it is raw and will potentially strike a nerve with those people with delicate sensibilities. That being said, they are one of the more impressive independent artists I have come across lately. They have performed with gay icon, Josie Cotton on an updated mix of her seminal classic, "Johnny, Are you Queer?" and are releasing music that is going to make you think. The production values of their music is high and it doesn't sound like something that was recorded in a basement (unless it's supposed to and then they doe that flawlessly as well). The lyrical content is thought provoking and both brothers have amazing flow that can only come from people that deserve to be in the rap game. They aren't looking for your approval and they don't seem to care if they hurt your feelings. That's not their job. They are here to give you their perspective on life and if you can find meaning in it, that's all that matters. I suggest you head over to youtube or facebook and check them out. Support our independent artists because when it all comes down to it, they are the ones on the front lines telling the stories that need to be told. Here's something new for you. Gay hip hop duo and identical twins Elephant with their new track, Queer Nation. They are edgy and raw and really foster a take no prisoners attitude. Check out their stuff and see if it's up your alley because as someone that is interested in new tracks and new sounds, they are pretty amazing.